Craig Cormick is a Canberra based author and science communicator. He has a PhD in creative communication of history, has published over a dozen books and his short stories have been published in Meanjin, Island, Westerly and many other literary magazines. He is a former chair of the ACT Writers’ Centre and his writing awards include the ACT Book of the Year Award (1999) forUnwritten Histories and a Queensland Premier’s Literary Award (2006) for A Funny Thing Happened at 27,000 Feet. His sea voyages have involved travelling to Iceland from Norway, voyaging to Australia’s three stations in Antarctica and sailing aboard the New Endeavour. Shipwrecks of the Southern Seas is published by Murdoch Books. Craig Cormick’s new book The Shadow Master is not due for release by Angry Robot until August 2014 but already interest is keen. Assassinations, impossible machines, torture, infamy – The Shadow Master is a witty, swashbuckling tale starring some of history’s most famous figures. 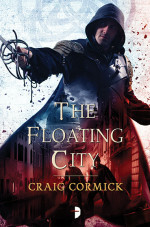 The Floating City, sequel to The Shadow Master will be available in Australia in July.